After signing a pre-contract agreement in April, Martin Angha has revealed how much he is looking forward to impressing in the Bundesliga with Nurnberg. The teenager leaves Arsenal after coming through their youth system. The 19-year-old explained that he is sad to leave the North London club but is excited about his future. “It makes me sad because I’ve had a great time here. I’ve been here for three-and-a-half years and I’ve enjoyed it a lot. 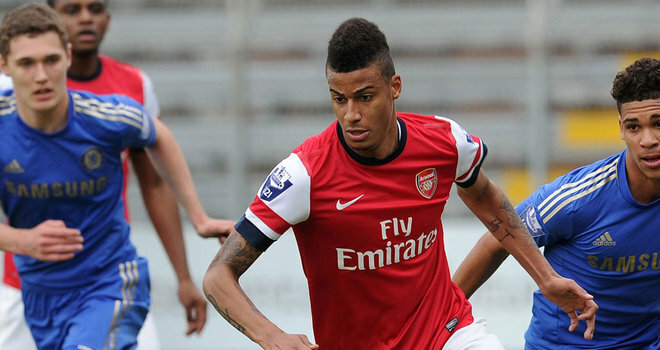 I’m sad it’s come to an end but I’m looking forward to a new challenge,” Angha told Arsenal’s official website. The versatile defender made his Arsenal debut in their 6-1 Carling Cup victory over Coventry City earlier this season and has also made a Champions League appearance against Olympiakos. Martin Angha played in the Champions League for Arsenal. “Martin Angha has been brought to a top level of football at Arsenal over the last few years. “He has shown his potential in London and will make the next steps in his development at FCN. We’re delighted to have signed such an interesting, young player.